Fancy another scrummy egg to add to your Easter collection this year? I've got a large Cadbury Caramel Egg for one of you lucky readers to win, simply complete the rafflecopter form below. I do love a Galaxy egg as I love Galaxty chocolate! Cadburys Creme Egg as they are the creamiest ever!! Whatever anyone chooses to buy me is just perfect. Though really, I would be quite happy with a bar of chocolate rather than all the packaging. My dream Easter egg is a large white chocolate egg. Smarties because it reminds me of when i was a kid although I do miss the really colourful wrapping they used to have on the eggs. I love creme eggs, all that ooey goo inside, yum, its a good thing they not sold all year round. 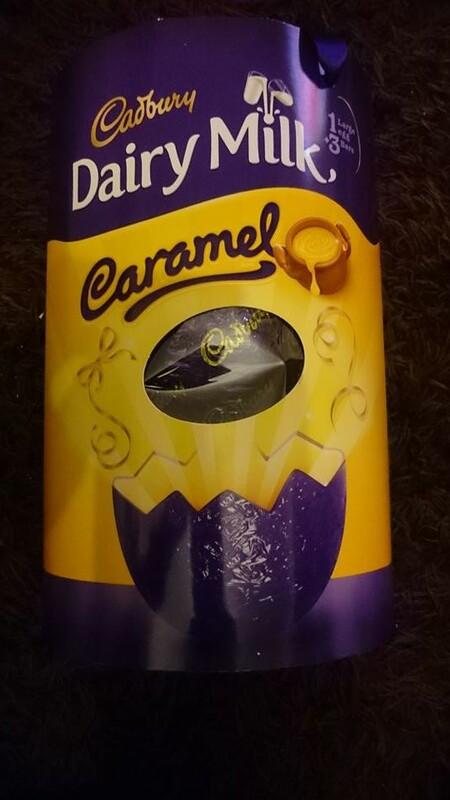 I love any egg that has caramel or toffee in it as I love caramel and toffee! Cadburys creme eggs,I love the fondant centre. Caramel is my favourite. I love caramel chocolate and I like the fact I get a few bars of chocolate in with my egg. My favourite has to be the Reeses eggs! I had one last year that was completely filled with peanut butter filling and it was so heavy but so heavenly too! My favourite Easter egg are those little Galaxy eggs that are always near the tills on the supermarkets - they are so scummy!!!!!! I love the Thorntons eggs, my favourite chocolate. creme egg - i love the centre of it! I always like the Cadbury Buttons ones, I guess I'm still a big kid at heart hehe! Galaxy because I like the chocolate. The Smarties egg as it has really nice chocolate! After eight, that mint chocolate egg is fabulous! Cadburys Flake. Love the chocolate and crumbly texture. I love Cadburys caramel eggs, the chocolate is so smooth and lovely and sweet. I love the fancy mini truffle eggs from Hotel Chocolat yum! but my little boys is caramel! I like cadbury creme egg the most. Always remember loving them deep fried from the chipy when pregnant with my eldest. 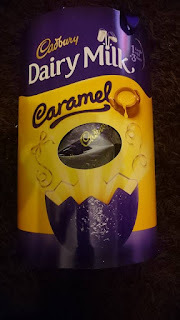 I love the cadbury caramel egg - I love cadbury chocolate and the smooth caramel is Just yummy!! I like a Twirl egg by Cadbury.. but wouldn't say no to a Ferrero Rocher! Wispa, because they taste divine!! Wispa is my all time fav but i'm not fussed! I think my favourite Easter egg might be this Caramel one because it's free! I love the Divine Chocolate Easter eggs, they look lovely as well as taste good! Cadburys twirl as it's pure chocolate goodness. I miss mars eggs, the small ones like creme egss. Generally Mini Eggs, but I really ain't fussy! Cadbury's Crunchie Egg, I'm a sucker for honeycomb! has to be a huge aero one love aero chocolate! My favourite is actually Cadburys caramel!! Mars fun size egg to dip in my tea. My favourite chocolate bar is the Crunchie, so the Cadburys Crunchie egg is naturally at the top of my list. I love all easter eggs! Dairy Milk egg, simple and still the best! Malteaser egg! I love maltesers! I love a good traditional milk Cadbury's! One of those giant Kinder egg easter eggs. I love milk and white chocolate and Im still a big kid so get excited about the toy! Galaxy Easter Egg - because its so smooth and creamy.